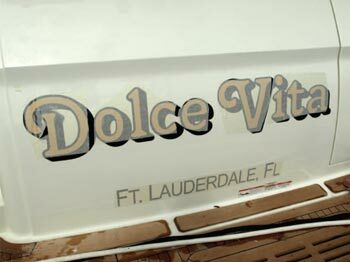 What’s it cost to produce these boat transom graphics? Robert Jahnke’s shop, Island Graphics, is in Merritt Island, Florida. 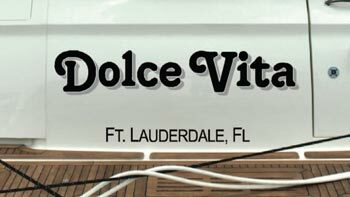 Boats are probably my favorite things to letter—the copy is minimal, the surface is great, and the customer often wants an interesting layout. They are also very profitable. When I received an email from a salesman at Sea Ray I was happy to hear they had a new 65-footer that needed a name on it. 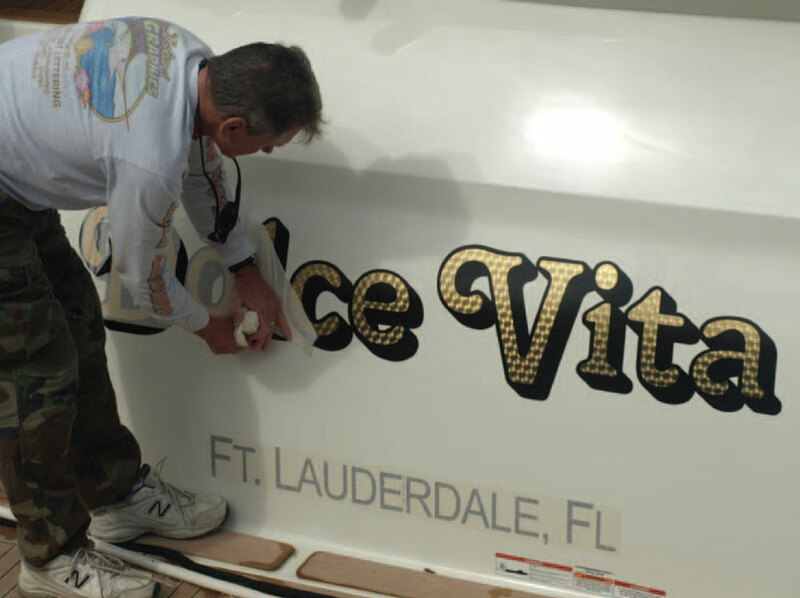 The email included a photo of the customer’s previous boat showing the name and letter style he wanted used on the new boat. The name was black with a gray drop shadow in the Tango font. 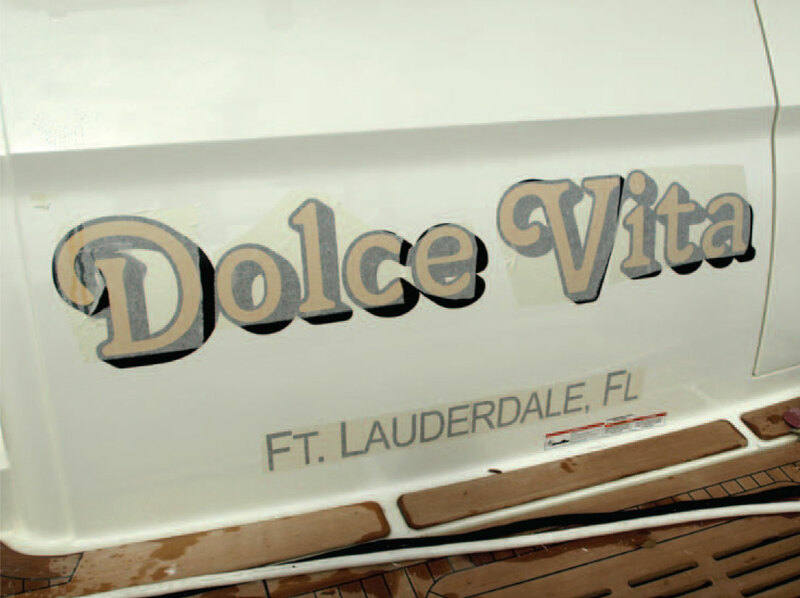 Normally customers get used to seeing their boat’s name in one font and it’s difficult for them to switch to another one. However, depending on the new boat or color scheme I have often been able to up-sell the project by showing them a sample of 22k RealGold vinyl www.realgoldinc.com. They usually love the look, and the advertised 15-year life helps convince new customers of the added value of upgrading to RealGold vinyl. 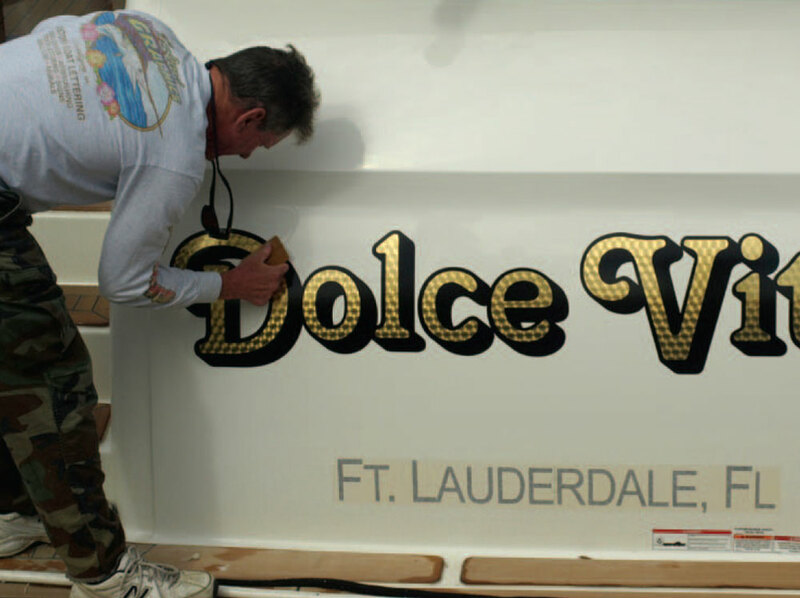 I have lettered these 65-footers before, so I had dimensions and photos of the boat transom. It was easy to superimpose the name over the photo, and the customer could see how it would look on the new boat. In my return email I also included an example of how the gold would look compared to the black with gray shadow. The next day I received the email with the customer’s decision: "He wants the gold." Work up drawings and handle correspondence: 45 minutes The owner’s previous boat had black vinyl lettering with a gray shadow, in a letterstyle called Tango. They planned to stay with that on their new boat. I emailed an image of that on their new boat’s transom and included a version done in 22K Real Gold Sign Vinyl. They chose the gold version. Cut and mask film: 30 minutes I did that at the shop then headed to the site. 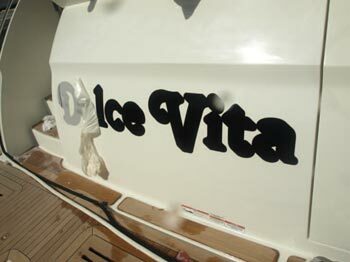 The black shadow and outline went on first, after cleaning the transom. After the black vinyl was down, I registered the Real Gold film and applied it with the help of a little homemade application fluid. ...then squeegeed the film down one more time. 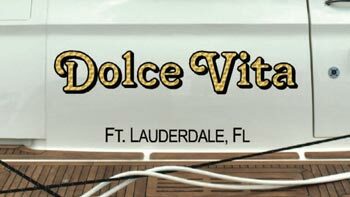 Travel and application: 90 minutes Before long, the Dolce Vita was complete and I was back at the shop. © Copyright 2019, RealGold Inc.